an organisation of volunteer Public Rights of Way Workers. We find it fascinating to find out where our Safe Tread products end up. Recently we discovered that a hard working volunteer organisation in the Lewes and Burgess Hill areas of East Sussex, 'The Monday Group', had made excellent use of them. The group was set-up by a set of residents in the village of Ditchling in 1961. Their aim was to re-open many footpaths that had been closed during the Second World War. Over the years their work has expanded and has received much publicity including articles by the Ramblers Association and a TV appearance or two along the way. In 1987 the organisation witnessed an upsurge in demand for their services following the great storms. A major benefit from this devastation was an uplift in female volunteers to the group who all wanted to help with tree clearance within their area. 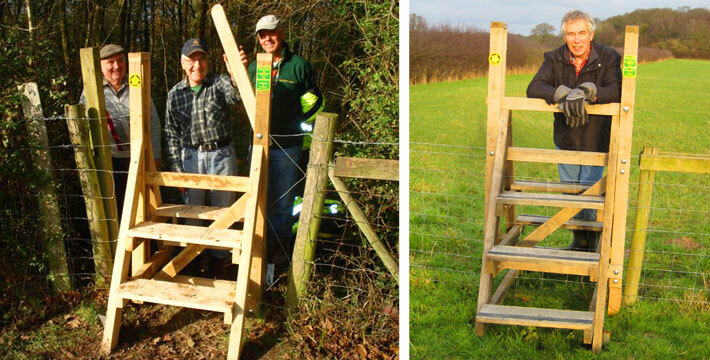 Today the group clears many public footpaths and makes and repairs wooden stiles and bridges on public footpaths. In 2010 The Monday Group made and installed 28 new stiles, modified or repaired 17 other stiles, added 16 dog gates, built/repaired 14 bridges and causeways and two sets of stairs. "Sui Generis' anti-slip decking strips are a real boon to our work. We have used the anti-slip strips on stiles and bridges with excellent results. One of the considerable benefits of your GRP strips is that they are lightweight, easy to apply and can even be fitted in very wet and muddy conditions and can be walked on immediately – so are perfect for us." The Monday Group has been maintaining public rights of way for over 50 years and has created over 1000 oak stiles within that time. Thanks to donations from the public, landowners, farmers and business the organisation looks set to continue creating public rights of way for the next 50 years. Anti-Slip Decking Strips are ideal for maintaining pathways, stiles and footbridges in rural and urban environments, especially on wooden surfaces. The anti-slip strips can be fixed to wood, which of course becomes slippery when wet, or when covered in algae or moss. The gritted strip surface prevents major slips, and as it's made from GRP glass reinforced plastic, the product is very durable and will last for years. Safe Tread non-slip gritted GRP deck or step strips are a quick and easy solution to improving safety in potential slip hazard areas whilst preserving an aesthetically pleasing appearance. 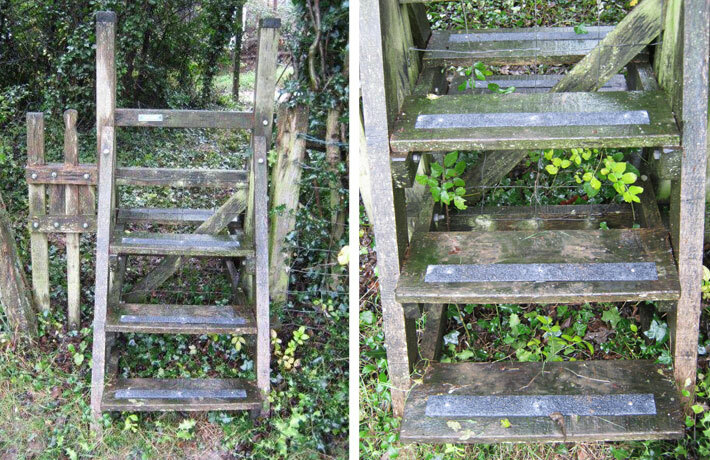 Slippery treads on stiles and steps have been a problem, particularly where deep in a hedgerow with overhanging trees. Anti-slip step strips were fixed to these slippery stiles. Images © Tom Meekings. The Monday Group is a volunteer organisation that maintains rights of way in the Sussex countryside. 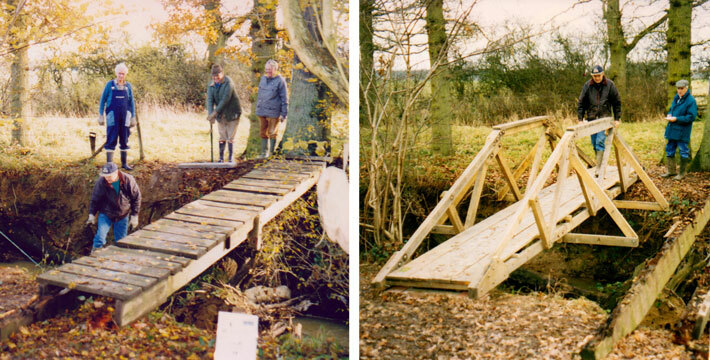 Old to new - the group repair, maintain and in this case build a new bridge, on public footpaths in the East Sussex area. 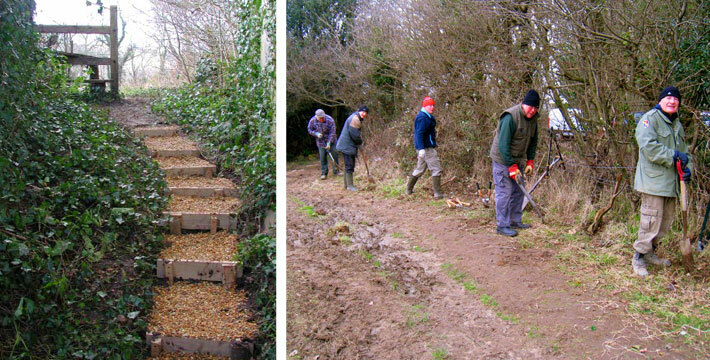 The Monday Group at work - new steps and path clearing. Images © Tom Meekings.